No company or celebrity is safe from South Park, and with the superhero focus of the franchise's newest video game, it's the lack of leading women in the Marvel Cinematic Universe being taken to task. 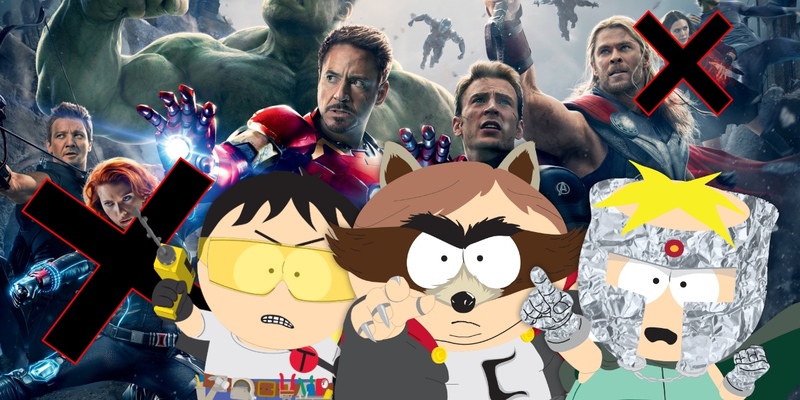 The diversity or larger "plan" being followed by Marvel Studios isn't the only target for South Park: The Fractured But Whole, with the series creators poking fun and parodying almost every aspect of superhero movie culture. But there's no denying that Marvel has become the biggest, broadest, and most profitable brand in the game. That also makes them the biggest target for commentary, the one thing every South Park fan has come to expect (regardless of how groundbreaking or noble the commentary may be). After spending hours playing through The Fractured But Whole, and seeing Eric Cartman's stranglehold on imagination - instead favoring his multi-phase franchise plan - most players will recognize that his superhero universe, much like Marvel's, is overwhelmingly male. It's a criticism Marvel Studios has faced for years, with the South Park video game taking an eerily accurate shot at the low priority placed on representing Marvel's women in leading roles. All things considered, the analogy at play isn't hard to grasp, now that every casual movie or TV fan knows about Marvel's Cinematic Universe, tie-in TV shows, and standalone universe of Netflix series. So as Eric Cartman argues that success and victory comes not from vanquishing evil, but from every hero involved sticking to his 'Franchise Plan,' it's clear to see the game's writers drawing a parallel between the franchise's bully and Marvel's studio roadmap. When the 'Franchise Plan' is shown in its entirety for just a brief second during The Fractured But Whole's campaign, it's intended to appear as a crowded, interconnected web of film, TV shows, animated releases, and Netflix programming. In this plan, it's only at the end of 'Phase 3,' in the film intended to ultimately destroy the boys' team of superheroes, the plan will finally "Intro a Chick." The kicker? There are actually fewer films on this blackboard blueprint than Marvel Studios has released in its shared universe to date, also spread across three distinct Phases (also featuring animated films and Netflix tie-ins). What's more, Marvel's first female-led movie - 2019's Captain Marvel - is also coming at the end of the studio's Phase 3... with most expecting her to be introduced when Marvel's own superteam faces Thanos in The Avengers: Infinity War. Which means what comes off as a tongue-in-cheek commentary on Marvel's rigid roadmap and after-thought inclusion of leading ladies... is actually pretty accurate. In fact, if not in spirit. Obviously, Eric Cartman's dislike for women is more despicable than any excuse or explanation offered by Marvel's leadership (although we'll let the audience members and critics decide if that matters). After playing his own role in the Marvel Universe, Joss Whedon didn't mince words when blaming a lack of superheroines on "stupid people" and "sexism." And if we're all being honest, the excuses put forward - that women heroes won't sell as many toys, for instance - sound just as fitting coming out of Cartman's mouth than any Hollywood executive's. Cartman can also claim, like many other executives have in the past, that he's not sexist: he's just following a plan created for success ahead of time. The fact that it just happens to include primarily men isn't evidence of prejudice. The South Park brand has found itself in controvery on nearly all sides of almost every issue by now, so few look to them as a paragon of the 'right' way to act or see the world (the creators would, admittedly, be the last to claim they should be). That doesn't make their commentary any less true, either. There is racial diversity within South Park, as well, though it plays into stereotypes for the sake of jokes and commentary equally. Token returns to make sure the heroes aren't all white, too. Regardless of your feelings about Marvel or South Park, in the end, the superhero movie genre shows its flaws, shortcomings, and largely ignored issues when placed under the microscope. The times are hopefully changing, with DC's Wonder Woman proving men and women are on board, and the aforementioned Captain Marvel movie - and Janet Van Dyne's promotion to title hero in Ant-Man and The Wasp. But it doesn't change the past, which means Cartman's superhero thinking will remain just as accurate for future players.